March 14 is annual celebration of Pi Day. This day commemorates the mathematical constant pi. The date of the observation was chosen on March 14, or 3/14, since these three digits are the most significant in decimal form of pi. One of the most important celebrations occurs in 2015, since it implies the first five digits of pi (3/14/15) and it should be observed at 9:26:53 a.m. or/and p.m, since these digits follow the sequence of pi. Pi Day was celebrated for the first time in 1988 at the San Francisco Exploratorium. It was organized by Larry Shaw, who worked there as a physicist. That celebration featured the staff and public marching around one of its circular spaces and eating fruit pies. 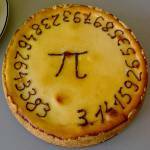 Modern observation of Pi Day includes different events. Eating pies is the most common, although sometimes pies are thrown, not eaten. Schools organize discussions of the significance of the number pi and hold competitions for students to recall pi to the highest number of decimal places.